Dorico is the next-generation scoring application from Steinberg, with a whole new way of working with music notation. 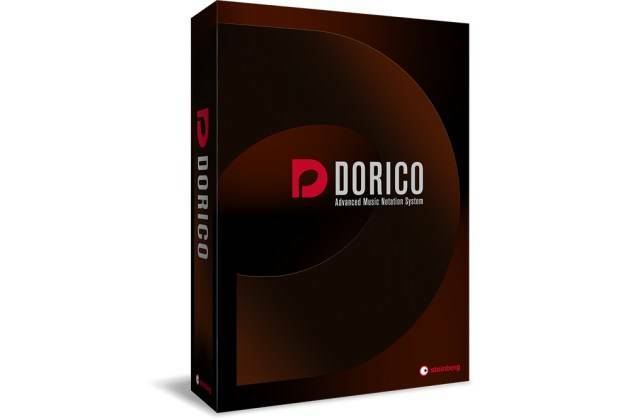 Built from the ground up with today's multi-core 64-bit CPUs in mind, Dorico will take advantage of all of your system's horsepower while the intuitive workflows help you focus on each aspect of score preparation. The beauty and balance of Dorico's output is unrivaled, with hundreds of options to control every aspect of your music's appearance. And with Steinberg's award-winning audio engine at its heart, Dorico allows you to use your VST instruments and effects to produce great-sounding playback too. Only full retail or academic/educational licenses for Sibelius and Finale are eligible for Crossgrade. Proof of eligibilty required. Dorico's workflows are divided into five distinct modes Setup, Write, Engrave, Play and Print that are all one mouse tap away from the toolbar, and can be freely changed at any time. Collapsible panels to the left, right and bottom of the window provide instant access to each modes features, and can be hidden with a single click or key command to show as much music as possible on your display. Dorico includes the same world-class audio engine that powers Cubase and Nuendo, delivering a crystal-clear 32-bit floating-point resolution and 192 kHz sample rate, with a pristine sound quality that is the hallmark of the Cubase music production experience. Dorico supports all VST 3-compatible virtual instruments and effects, and includes the HALion sample engine and channel strip modules, including a top-end compressor and brickwall limiter that can be inserted on each channel. Developed in consultation with experienced engravers working with some of the worlds most demanding music publishers, the automatic engraving engine at the heart of Dorico produces the most elegant, beautiful results of any scoring application. Attention has been lavished on every detail of the appearance of the music, from the meticulous design of every symbol in the Bravura font, to the precise placement rules for every notated element. To make your projects sound incredible, Dorico includes the complete HALion Symphonic Orchestra library and more than 1,300 production-ready sounds from HALion Sonic SE 2. HSO includes more than 100 patches and combinations, including strings, woodwinds, brass and percussion instruments with dozens of different playing techniques, covering all common articulations and bowings in unrivaled expressiveness and full dynamic range. Handling works that contain multiple independent movements is a chore in other scoring programs, but in Dorico it's as simple as adding a new flow to your project. Each flow can share instrumentation or use completely different instruments, and can be brought together in any combination in conductor's scores and instrumental parts. Other scoring programs are capable of producing beautiful results, but require advance planning and patience: they are to music what the typewriter is to the written word. But Dorico is like a word processor, not only allowing you to harness the power of its superior automatic engraving engine, but also giving you tools to edit, re-edit and adapt your musical material without ever getting in your way. Dorico's rich support for advanced notations opens up new expressive possibilities for your music. Define your own tonality systems, including custom accidentals that modify the written pitch by any number of EDOs, and create custom key signatures. Write freely in open meter, adding or deleting barlines wherever they are needed. Create tuplets of any complexity, even across barlines. Create slurs with any number of independent curving segments for total control. Producing consistent page layouts in other scoring programs can be very time-consuming, but Dorico's sophisticated page layout system makes consistent page layouts quick and easy to achieve. Define and apply master pages with automatic page numbers, headers and footers, and easily override the layout of individual pages as needed. Dorico provides a familiar piano roll editor for making fine adjustments to playback without affecting the printed notation, including editing continuous controllers. Control your VST 3 instruments directly, including defining VST Expression Maps to access the advanced playing techniques in your sample libraries. Or simply use the provided HALion Symphonic Orchestra to bring your scores to life - and you can also use the library in any other VST-compatible host. Whether you are writing for the concert hall, the theater, the church or the scoring stage, Dorico provides professional composers and arrangers with the creative tools your demanding work requires. Today's music engravers and publishers demand results that meet their exacting standards but with ever tightening deadlines and a drive for reducing costs. Dorico is the next-generation scoring software designed to provide beautiful results more quickly and efficiently than ever before, enabling you to get your publications finished to the standard you expect on time and on budget. As a student working to discover your own voice as a composer through an exploration of existing styles, genres and techniques, you need an adaptable and efficient tool at your fingertips to facilitate your musical development. As a teacher producing assignments, arrangements for student ensembles or assessing submitted work, you need a tool that has the same sophisticated understanding of music that you do. Composers, orchestrators and copyists producing music for film, TV, games and other media are required to handle complex workflows involving multiple people, multiple applications, multiple file formats and tight deadlines. With Dorico added to your toolbox, you will be able to handle an increasing number of steps in your workflow in a single application. - DVD-ROM drive for software installation using included optical media. Not needed if download version was purchased. - Internet connection required for activation, account setup and personal product registration. Additional downloads may be required for installation.